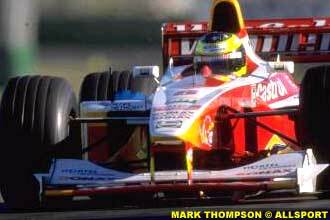 Ralf Schumacher's performance at Albert Park has had two very different faces in the past. In his first two years with Jordan, things went pretty disastrous, while on the other hand his last two years with Williams were very successful. Young Schumacher's Formula One debut went by pretty silently. At the 1997 Australian Grand Prix, he barely had the time to impress in the race, while there were more than enough things happening around to distract the attention from Michael's little brother. McLaren grabbed its first victory after a 49-race dry spell; reigning World Champion Damon Hill barely qualified in the Arrows; Lola made its one race attempt at a comeback; and Jackie Stewart's team made its debut, while Alain Prost was Ligier's new team owner. In the first free practice Schumacher did make a good impression. In his very first official Formula One session, the German put his Jordan in a very good fifth spot. Both he and his teammate Giancarlo Fisichella used the Friday practice for merely getting comfortable with the circuit, rather than trying to put in the fastest possible time. Judging from his performance, Ralf felt comfortable right away. Schumacher himself appeared very satisfied, only commenting that the track was very dirty. The second free practice session, on Saturday morning, confirmed Schumacher's complaint. With the track cleaned up by the cars on Friday, times were a lot quicker the next day. Schumacher dropped back to seventh place, but this was barely a surprise since both McLarens were the ones to pass him. Meanwhile, Ralf was a full second quicker than his more experienced teammate. Come Saturday afternoon, things turned around 180 degrees for Schumacher. While most drivers were able to keep the morning pace, Schumacher was no less than two seconds slower. Disappointedly, he commented: "I really do not understand what happened out there today. Things went so well yesterday, but the car felt completely different this afternoon. The temperature was one thing which affected us, but it does not explain everything. The main problem was in low speed corners. Also I was blocked on a few laps, but in truth the balance was never there. We are very disappointed after so many promising pre-season tests and the good results in practice." The end result was a 12th spot on the grid, something many rookies would sign for right away. On race day, things got better for the young German, when we outperformed his famous brother in the warm-up. However, once the actual race started, things went the other way again. After having made a great start, which brought him right up to eight place, the bad qualifying had been overcome within minutes. However, just as many minutes later, it was all over for Schumacher. In his debut race, the gearbox failed completely after just two laps. The next year, Ralf Schumacher was no longer a rookie. With 13 points and a podium finish in Argentina, young Schumacher showed he had potential. With that in mind, his return to Melbourne was expected to give a more satisfying result than the year before. Again on Friday the signs were good. On a drying track, Schumacher set the sixth fastest time, over a second faster than his very experienced teammate Damon Hill. The difference was gone after the next practice session on Saturday morning, when both Jordans ended up in a somewhat disappointing 10th and 11th place. Furthermore, both drivers said they weren't very happy with the car, after several spins. Judging by Ralf's comments about the car having both oversteer and understeer, the best option for Jordan in qualifying seemed to be to drive in a straight line. As the Albert Park circuit features very few of those, it came as no surprise that Schumacher and Hill weren't able to make a major impact in qualifying. Schumacher was able to outqualify his teammate, but only with the smallest of margins: seven thousands of a second separate the two buzzing hornets. Schumacher had to start the race from ninth place, while Hill was tenth. 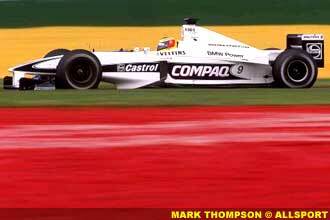 Just like the year before, the warm-up showed the best of Ralf Schumacher. The young Jordan driver only had his brother's Ferrari and both McLarens ahead of him, while his teammate came even closer than in qualifying - now just three thousands behind. And again, the warm-up was where the good things ended. After a disastrous start, Schumacher dropped back from ninth to 14th in the first lap. After a short trip through the grass, he came back onto the track just ahead of Stewart driver Jan Magnussen. The Dane, in an attempt to outmaneuver Schumacher, then hit him. For 1999, Ralf Schumacher came to Australia a changed man. Even though the 1998 season had brought him just one point more than his debut season, he gained a lot of confidence by scoring successive podiums at Spa - where he should have won, but stayed behind teammate Damon Hill - and Monza. 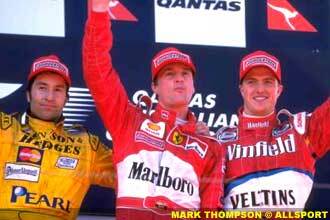 The 1999 Australian Grand Prix also showed Schumacher in a new car. The German had made the move to Williams, where he and CART champion Alex Zanardi replaced Heinz-Harald Frentzen and Jacques Villeneuve. Unlike previous years, free practice didn't go very smoothly for Schumacher. On Friday he ended up in tenth place, just behind his teammate, while on Saturday things got worse and Schumacher dropped back to 15th. Despite all this, Ralf wasn't concerned yet, as the team had just concentrated on the race setup. The new Williams driver commented: "Based on the way we performed today, we are confident that we will be able to qualify reasonably well." Reasonably well was indeed the correct prediction. After an intense hour on Saturday afternoon, he found himself in eighth position, well ahead of Zanardi. Warm-up showed Schumacher in the same position and thus came the race. Before the race started, Schumacher already made his first progress, as both Stewarts started to smoke. 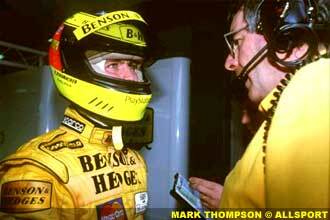 Rubens Barrichello, fourth on the grid, stepped into the spare car, but had to start from the back of the grid. Then at the start of the parade lap, both Michael Schumacher and Tora Takagi let their engine stall. The result was that they too had to move to the back of the grid. As a result, Ralf Schumacher now had just four cars ahead of him, instead of the scheduled seven. After the first lap, the German reduced that number to three, as he passed his former teammate and now Benetton driver Giancarlo Fisichella. Luckily for the Williams driver, his race now extended beyond the two lap limit which he had faced in Melbourne in his first two attempts. After thirteen laps, Schumacher found himself yet another spot higher in the order. McLaren's David Coulthard suffered the same fate as Schumacher had had two years ago: his gearbox failed. 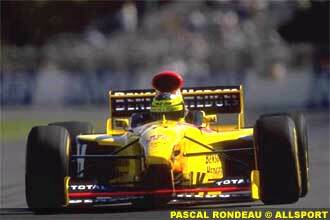 In the next lap, Canadian Jacques Villeneuve crashed, after which the safety car had to come on track. Once the safety car left the track again, a problem with Mika Hakkinen's accelerator caused a rather chaotic restart. While Hakkinen dropped back to the back of the field, Jarno Trulli surprised Schumacher and took over third place. Just a few laps later, the second CART champion also crashed. Schumacher's teammate Zanardi lost the back of his car and crashed out rather hard, causing a second safety car situation. As Jarno Trulli made a pitstop during the safety car situation, Schumacher now climbed into third. Which was the position where the German found himself once the pitstops were done. He then showed the experience he gained in his first two seasons by staying calm and securing the podium finish, just seven seconds behind first time winner Eddie Irvine. Last year Schumacher got off to a good start again. On Friday morning, he was sixth with just nine laps done. The afternoon session proved of very little use, after an oil leak spoiled most of his session. In Saturday practice he set the fifth fastest time. And yet again, Melbourne proved to be a roller coaster of good and bad for Schumacher jr. In the afternoon qualifying session more technical difficulties prevented the German from exploiting his Williams's potential to the maximum. The resulting eleventh place certainly was no reason to celebrate, and with a similar result in Sunday's morning warm-up, hopes in the Williams motor home weren't especially high for the race. 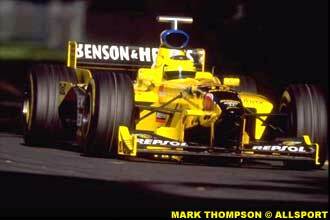 Initially, the downward spiral continued, when Schumacher had quite a bad start, which dropped him back to 13th place. After six laps, the tide started to finally turn again. Pedro de la Rosa's Arrows crashed out, taking Eddie Irvine's Jaguar along. De la Rosa's teammate Jos Verstappen also retired. Later it became clear that both Arrows suffered a suspension failure within seconds. To clear up the debris, the safety car was deployed. Schumacher, in tenth under the safety car, then got another free position improvement, when David Coulthard's engine went up in smoke. A few laps later Mika Hakkinen's McLaren also gave up with an engine problem, promoting Schumacher to eighth place. Even then things didn't look like success, but the pitstops changed all that. The Williams team adopted the strategy to stay out as long as possible, which proved to be the right decision. Slowly Ralf Schumacher gained place after place and when Jarno Trulli's Jordan became the third car to suffer an engine failure, Schumacher briefly occupied second place just before his pitstop. However, after his stop, young Schumacher came back on track in third, which he safely kept until the end of the race. 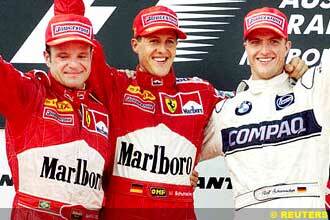 The end result was about as good as it could get for the Schumacher family: Michael first and Ralf third. This year, the Australian Grand Prix will be the fifth for Ralf Schumacher. Will he continue his upward spiral down under? Could he take one step up on the podium? With just a few days away, that remains to be seen.